MEMORY GEM: "For God so loved the world, that He gave His only begotten son, that whosoever believeth in Him should not perish, but have everlasting life. " – John 3:16. STUDY AIM: To understand that Jesus, the Word, is LOVE. INTRODUCTION: "By coming to dwell with us, Jesus was to reveal God both to men and to angels. He was the Word of God, God's thought made audible." – The Desire of Ages, page 19. "The law requires righteousness, – a righteous life, a perfect character; and this man has not to give. He cannot meet the claims of God's holy law. But Christ, coming to the earth as man, lived a holy life, and developed a perfect character." – The Desire of Ages, page 762. 1. WHO IS OUR PERFECT EXAMPLE OF LOVE? John 14:6. NOTE	--- "We may be active, we may do much work; but without love, such love as dwelt in the heart of Christ, we can never be numbered with the family of heaven. " – Christ's Object Lessons page 158. 2. HOW DID JESUS LOVE? John 15:10. NOTE	--- "The love of Christ is not a fitful feeling, but a living principle (LAW), which is to be made manifest as an abiding power in the heart. " – Acts of the Apostles, page 516. 3. WHY DID JESUS COME TO THIS EARTH? John 3:16; Matt. 18:11. NOTE --- "It was to manifest this glory that He came to our world. To this sin-darkened earth He came to reveal the light of God's love (LAW – CHARACTER), – to be 'God with us. " – The Desire of Ages, page 19. "None but the Son of God could accomplish our redemption; for only He who was in the bosom of the Father could declare Him. Only He who knew the height and depth of the love (character) of God could make it manifest." – Steps to Christ, page 14. NOTE	--- "God is LOVE." Steps to Christ, page 10. 5. WHAT IS GOD'S LOVE? 1 John 5:3. NOTE --- "But man was deceived; his mind was darkened by Satan's sophistry. The height and depth of the love of God he did not know. For him there was hope in a knowledge of God's love (LAW). By beholding His character he might be drawn back to God. Through Jesus, God's mercy was manifested to men. . . The LAW reveals the attributes of God's character. . ." – The Desire of Ages, page 762. "The law of God is as sacred as himself. It is a revelation of his will, a transcript of his character, the expression of divine LOVE and wisdom. " – Patriarchs and Prophets, page 52. 6. HOW DID GOD SEND HIS LOVE TO THE EARTH? John 1:1, 14. 7. IN WHAT WAY MAY WE HAVE JESUS (THE WORD – LOVE) IN OUR HEARTS? Mal. 4:4; Rev. 3:20; Ps. 119:11. NOTE --- "Our Redeemer sends His MESSENGERS to bear a testimony to His people. He says: 'Behold, I stand (through My messengers) at the door, and knock: if any man hear My voice (Present Truth), and open the door, I will come in to him, and will sup with him, and he with Me.' Revelation 3:20." – Testimonies for the Church, Vol. 6, page 262. "I would speak in warning to those who have stood for years resisting light and cherishing the spirit of opposition. How long will you hate and despise the messengers of God's righteousness? God has given them His message. They bear the word of the Lord. There is salvation for you, but only through the merits of Jesus Christ. . . Let me prophesy unto you: Unless you speedily humble your hearts before God, and confess your sins, which are many, you will, when it is too late, see that you have been fighting against God. . . Go on a little longer as you have gone, in rejection of the light from heaven, and you are lost. 'The man that shall be unclean, and shall not purify himself, that soul shall be cut off from among the congregation.' I have no smooth message to bear to those who have been so long as false guideposts, pointing the wrong way. If you reject Christ's delegated messengers you reject Christ. . . I entreat you now to humble yourselves, . . . Say unto the Lord, 'Mine iniquities have separated between me and my God. O Lord, pardon my transgressions. Blot out my sins. . .' Praise His holy name, there is forgiveness with Him, and you can be converted, transformed." – Testimonies to Ministers, pages 96-98. MEMORY GEM: "And this I pray, that your LOVE may abound yet more and more in knowledge and in all judgment." – Phil. 1:9. STUDY AIM: To see clearly the great need for LOVE. INTRODUCTION: "LOVE is the key to open hearts, but the precious plant of LOVE has not been cherished." – Testimonies, Vol. 3, p 535. "Faith and LOVE are the true riches, the pure gold which the True Witness (The Branch) counsels the lukewarm (Laodicean S. D. A. and D. S. D. A. ) to buy. . ." – Test. Vol. 4, p.88. "Again and again has the voice from heaven addressed you. Will you obey this voice? Will you heed the counsel of the True Witness to seek the gold (faith and LOVE) tried in the fire, the white raiment, and the eyesalve . . . The deadly lethargy of the world is paralyzing your senses . . . The judgments of God are soon to be poured out upon the earth." – Testimonies for the Church, Vol. 5, page 233. 1. HOW DOES INSPIRATION DESCRIBE THE "LOVELESS" CONDITION OF LAODICEA? Rev. 3:13-17. NOTE	--- "The fervor of the love of God is wanting in their hearts. . ." – Review and Herald, July 23, 1889. 2. WHO IS "LOVELESS" LAODICEA TODAY? Matt. 13:24-30; 20:5; 25:1-13. NOTE --- "Laodicea signifies the judging of the people, or, according to Cruden, a just people. This church exists in the time of the judgment (S.D.A.). . . This is a time of great profession, with but little vital godliness (LOVE) and true piety." – Bible Readings for the Home, page 283. "I was shown that the testimony to the Laodiceans applies to God's people (S.D.A. and D.S.D.A.) at the present time. . ." – Test. Vol. 1, p. 186. 3. MAY A PROFESSED "DAVIDIAN" BE A LOVELESS LAODICEAN? Eze. 8:15-18.
think you have all the Truth . . . if you never give it a thought that you may be slamming your door against a Truth-bearer . . . if you do all these or any part of them, then you must be as good a Laodicean as you can possibly be, not a Davidian." – Timely Greetings, Vol. 1, No. 8 revised, page 28. 4. WHAT IS A "TRUE" (A LOVING) DAVIDIAN? Rev. 3:7. NOTE	--- "But if you are aware that your garments are filthy, and your iniquity not blotted out; if you realize that you are to walk (LOVE) in God's ways (LOVE) as He directs through the Joshua of today, if you are all for God and not at all for self or for the world, then, of course, you either are, or are beginning to be., a Davidian. If you have not attained to all of these, you should SEE THAT YOU DO; and if you already have, then keep advancing in the light, and for certain you shall finally stand on Mt. Zion with the Lamb." – Timely Greetings, Vol. 1, No. 8 revised, page 28. 5. IN WHICH PROPHECY DOES JESUS SHOW THE NEED FOR LOVE TODAY? Rev. 3:18. 6. HOW DOES JESUS SHOW HIS LOVE FOR US (LAODICEA)? Rev. 3:19, 20; John 15:2 last part. 7. WHEN LAODICEANS LEARN HOW TO LOVE WHAT WILL HAPPEN? Isa. 60:3-22. NOTE – "Then a multitude (Rev. 7:9) not of their faith, seeing that God is with His people (Rev. 14:1), will unite with them in serving the Redeemer." – E. G. White, Review and Herald, Feb. 25, 1902. 8. WHAT HAPPENS TO THOSE WHO REFUSE TO LEARN HOW TO LOVE? Rev. 3:16; Eze. 9:6. NOTE --- "Our own course of action will determine whether we shall receive the seal of the living God or be cut down by the destroying weapons." – Testimonies, Vol. 5, page 212. "Not all who profess to keep the Sabbath will be sealed." – Ibid., page 213. 9. WHAT HAVE LAODICEANS DONE, AS A PEOPLE, THAT HAVE MADE THEM VOID OF LOVE? Eze. 8:17. NOTE -- "You will meet with those who will say, 'You are too much excited over the matter. You are too much in earnest. You should not be reaching for the righteousness (love) of Christ, and making so much of that. You should preach the law (10 commandments). As a people we have preached the law (10 commandments) until we are as dry as the hills of Gilboa, that had neither dew nor rain. We must preach Christ (LOVE) in the law (Levitical law). . ." Review and Herald, Mar. 11, 1890. MEMORY GEM: "But they mocked the messengers of God, and despised his words, and misused his prophets." – 2 Chron. 36:16. STUDY AIM: To review the sad history of the rejection of Jesus' love (truth) by S.D.A. in 1888, and the promise of its return and final acceptance. INTRODUCTION: "In 1888 in the General Conference held at Minneapolis, Minn., the angel of Revelation 18 came down to do his work, and was ridiculed, criticized, and rejected and when the message he brings again will swell into a loud cry, it will be ridiculed, and spoken against, and rejected by the majority." – E. G. White, Taking Up A Reproach. 1. WHAT CAME TO THE SDA CHURCH IN 1888? Rev. 3:20. NOTE --- "The Lord in His great mercy sent a most precious message to His people through Elders Waggoner and Jones. This message was to bring more prominently before the world the uplifted Saviour, the sacrifice for the sins of the whole world. . . it invited the people to receive the righteousness of Christ, which is made manifest in obedience to all the commandments of God. . . The message of the GOSPEL of His grace was to be given to the church in clear and distinct lines, that the world should no longer say that Seventh-day Adventists talk the law, the law (ten commandment law, the law of condemnation), but do not teach or believe Christ (and His atonement as it is found in the ceremonial law). . . The efficacy of the blood of Christ was to be presented to the people with freshness and power. . . Therefore God gave to His servants a testimony that presented THE TRUTH AS IT IS IN JESUS (The Lamb of God, the BRANCH our RIGHTEOUSNESS). . . " – Testimonies to Ministers, pp 91-93. 2. WAS THIS MESSAGE RECEIVED? 2 Chron.36:16. See Intro. NOTE --- "The message has never been received, nor proclaimed, nor given free course as it should have been in order to convey to the church the measureless blessings that were wrapped within it. . . O that we had all listened as we should to both warning and appeal as they came to us in that seemingly strange, yet impressive, way at the Conference of 1888! What uncertainty would have been removed, what wanderings and defeats and losses would have been prevented! What light and blessing and triumph and progress would have come to us!" – A. G. Daniells, G. C. President 1901-1922 – Christ Our Righteousness, pp. 47, 69. "For nearly two years, we have been urging the people to come up and accept the light and the truth concerning the righteousness of Christ. . . They do not let the Saviour in." – Review and Herald, Mar. 11, 1890. 3. WOULD THE MESSAGE RETURN TO SDA? See Introduction. HOW? Amos 3:7. 4. WHAT WAS THE CONDEMNATION? THE CALL? Rev. 2:4, 5. NOTE	--- "I am instructed to say that these words (Rev. 2:4,5) are applicable to Seventh-day Adventist churches in their present condition. The LOVE of God has been lost. . . God calls for a spiritual revival and a spiritual reform." – E. G. White, Review and Herald, Feb. 25, 1902. 5. SINCE SISTER WHITE AND ELDERS WAGGONER AND JONES ARE DEAD, THROUGH WHOM WOULD JESUS AGAIN SPEAK? Rev. 18:1; Zech. 3:1-10. NOTE --- "Who is to bring this revival and reformation, this great change? The BRANCH. . . Here is seen an organization having a Leader and an under leader – the Lord and Joshua." – Timely Greetings, Vol 1, #8 rev pp 24, 26. 6. WHAT PERIOD WAS THE BRANCH TO BE USHERED IN? Joel 2:24-27; Rev. 18:1. NOTE --- "Zechariah's vision of Joshua and the Angel (Christ, The Branch, Zech. 3:8; 6:12) applies with peculiar force to the experience of God's people in the closing up (Judgment of the living) of the great day of atonement." – Testimonies for the Church, Vol. 5 page 472. 7. WHAT ARE WE PRIVILEGED TO BEHOLD TODAY? Zech. 6:12; Mal. 4:4,5. 8. WHAT WAS THE BEGINNING OF THE MESSAGE OF REV. 18:1 IN 1888? Rev. 3:18. NOTE --- "The message of the gospel of His grace (LOVE) WAS TO BE GIVEN to the church. . . The efficacy of the blood of Christ WAS TO BE PRESENTED. . . This is the testimony that must go throughout the length and breadth of the world. It presents the LAW (God's love) and the GOSPEL (Jesus' love), binding up the two in a perfect whole." – Testimonies to Ministers, pages 92, 94. 9. WHAT PROPHECY SHOWS THE FINAL ACCEPTANCE OF THE MESSAGE REJECTED IN 1888 BUT SOUNDING AGAIN THROUGHOUT LAODICEA TODAY? Matt. 24:4-8, 11-13, 32-47. NOTE --- "In visions of the night, representations passed before me of a great reformatory movement among God's people. Many were praising God. . . .Hundreds and thousands were seen visiting families and opening before them the word of God. . . there seemed to be a reformation such as we witnessed in 1844 (under the Second Angel of Rev. 14:8)." – 9 T. 126. Read also EW 277. MEMORY GEM: "For THIS is the love of God, that we keep his commandments." – 1 John 5:3. STUDY AIM: To show that LOVE means right-doing in all the various aspects of life. INTRODUCTION: "Supreme love for God and unselfish love for one another, -- this is the best gift that our heavenly Father can bestow. This love is not an impulse, but a divine principle, a permanent power. . . True sanctification comes through the working out of the principle of love. . . Pure doctrine will blend with works of righteousness heavenly precepts (love) will mingle with holy practices (love)." – Acts of the Apostles, pages 551, 560. 1. WHO IS KNOWN AS THE "APOSTLE WHOM JESUS LOVED"? John 21:20. NOTE --- "John did not naturally possess the loveliness of character that his later experience revealed. . . He was not only proud, self-assertive, and ambitious for honor, but impetuous, and resentful under injury. He and his brother were called 'sons of thunder.' Evil temper, the desire for revenge, the spirit of criticism, were all in the beloved disciple. But beneath all this the divine Teacher discerned the ardent, sincere, loving heart." – A.A. p. 540. 2. AFTER HIS CONVERSION, WHAT DID JOHN TEACH? 1 John 5:3. NOTE --- "John did not teach that salvation was to be earned by obedience; but that obedience was the fruit of faith and love. . . John was a teacher of holiness, and in his letters to the church he laid down unerring rules for the conduct (love) of Christians." – Acts of the Apostles, pages 563, 559. 3. WHAT KIND OF LOVE DOES JOHN TEACH? 2 John 6; Eccl. 12:13. NOTE --- "John was a teacher of practical holiness. He presents unerring rules for the conduct of Christians. They must be pure in heart and correct in manners. . . The child who loves his parents will show that love by willing obedience; but the selfish, ungrateful child seeks to do as little as possible for his parents, while he at the same time desires to enjoy all the privileges granted to the obedient and faithful. The same difference is seen among those who profess to be the children of God." – The Sanctified Life, pp. 57, 59. 4. WHAT DOES THE WORD "LOVE" MEAN? John 3:16. NOTE --- "The Greeks had three words to convey the ideas we seek to express by our one word 'love;' agapan, philein, and eran. "PHILEIN in general describes affectionate, sentimental love based on the emotions and feelings. Insofar as it is based on the feelings it is subject to change as the feelings change. ERAN denotes passionate, sensual 'love,' love that operates essentially on the physical plane . . . ERAN is not used in the NT (New Testament). In the NT AGAPAN when contrasted with PHILEIN, describes love from the standpoint of respect and esteem. It adds principle to feeling in such a way that principle controls the feelings. It brings into play the higher powers of the mind and intelligence. Whereas philein tends to make us 'love' only those who 'love' us, AGAPAN extends love even to those who do not love us. AGAPAN is selfless, whereas ERAN is purely selfish, and even PHILEIN may, at times, be marred by selfishness. "The noun form, AGAPE, is confined almost exclusively to the Bible. The AGAPE of the NT is love in its highest and truest form, the love than which there is no greater -- love that impels a man to sacrifice himself for others. . . IT IMPLIES REVERENCE FOR GOD AND RESPECT FOR ONE'S FELLOW MEN. It is a divine principle of thought and action that modifies the character, governs the impulses, controls the passions, and ennobles the affections." – S.D.A. Bible Commentary, Vol. 5, page 340. 5. HOW DO WE LOVE (RESPECT, REVERE) GOD THE FATHER? 1 John 5:3. 6. HOW DO WE LOVE (RESPECT, REVERE) GOD	THE SON? John 15:10. 7. HOW DO WE LOVE (RESPECT, REVERE) ONE ANOTHER? Matt. 7:12. SPECIAL NOTE --- "Moses was commanded to write (in a book, the Levitical Law), as God should bid him, judgments and laws giving minute instruction (how to love or respect – revere) as to what was required. These directions relating to the duty (love – respect) of the people TO GOD, TO ONE ANOTHER, AND TO THE STRANGER, were only the principles of the ten commandments (love to God and man) amplified. . . designed to guard the sacredness of the ten precepts. . ." – Patriarchs and Prophets, page 364. "Christ. . . gave to Moses statutes and requirements necessary to a living religion. . ." – Ellen G. White, Review and Herald, May 6, 1875. MEMORY GEM: "By this we know that we love the children of God, when we love God, and keep his commandments. " – 1 John 5:2. STUDY AIM: To identify God's LOVE or law. INTRODUCTION: "That law of ten precepts of the greatest LOVE that can be presented to man is the voice of God from heaven speaking to the soul in promise, 'This do, and you will not come under the dominion and control of Satan.' There is not a negative in that law, although it may appear thus. It is DO, and Live." – E. G. White, Letter 89, 1898. 1. OF WHOM IS THE 10 COMMANDMENT LAW A TRANSCRIPT? Rom. 3:21; 10:4. NOTE --- "The law of God is as sacred as himself. It is a revelation of his will, a transcript of his character, the expression of DIVINE LOVE (respect and esteem) and wisdom." – Patriarchs and Prophets, page 52. 2. WHAT DOES THE 10 COMMANDMENT LAW REVEAL? Rom. 3:20. NOTE --- "In the Ten Commandment Law is the memorial of creation and the Sign or Seal of the Creator. By it is the knowledge of sin. . . Before this earth was created the law of Ten Commandments was and still is the foundation of God's government, the transcript of His character, the very essence of His presence in righteousness. This law resides under 'the mercy seat in the courts above.' " – God's Covenant, page 1. 3. IS THE 10 COMMANDMENT LAW THE ONLY ONE GOD GAVE MANKIND? Deut. 10:1-5; 31:24-26. NOTE --- "That the obligations of the decalogue might be more fully understood and enforced, additional precepts were given, illustrating and applying the principles of the ten commandments. These laws were called judgments. . . (and) was written by Moses in a book." – Patriarchs and Prophets, pp. 310-312. 4. WHICH OF THE 10 COMMANDMENTS TELL US HOW TO LOVE (RESPECT, REVERE) GOD? Ex. 20:1-11.
precepts of Jehovah, and then seek diligently to correct our errors." – 4 T. 632. "Whatever we cherish that tends to lesson our love for God or to interfere with the service due him, of that do we make a god . . . The second commandment forbids the worship of the true God by images or similitudes. . . ('A few condemned pictures, urging that they are prohibited by the second commandment, and that everything of this kind should be destroyed. . . but God Himself employed pictures and symbols to represent to His prophets lessons which He would have them give . . . Prophetic history was presented to Daniel and John in symbols, and these were to be represented plainly upon tables. . . – E. G. White, Historical Sketches. page 212) . . . (the third) prohibits false oaths and common swearing . . . forbids us to use the name of God in a light or careless manner . . . thoughtless mention of God in common conversation, by appeals to him in trivial matters. . . repetition. . . (the fourth) Remember the Sabbath day to keep it holy. . . Acts of necessity and mercy are permitted. . . the sick and suffering are at all times to be cared for; but unnecessary labor is to be strictly avoided." – Patriarchs and Prophets, pages 305-307. 5. WHICH OF THE 10 COMMANDMENTS TELL US HOW TO LOVE (RESPECT) OUR FELLOWMEN? Ex. 20:12-17. NOTE --- "Parents are entitled to a degree of love and respect which is due to no other person. . . earlier years of life, parents shall stand in the place of God to their children. And he who rejects the rightful authority of his parents, is rejecting the authority of God. The fifth. . . requires children. . . to yield respect, submission. . . obedience. . . love and tenderness, to lighten their cares, to guard their reputation. . . succor. . . comfort them in old age. It also enjoins respect for ministers and rulers, and for all others to whom God has delegated authority. . . (sixth) All acts of injustice that tend to shorten life; the spirit of hatred and revenge, or the indulgence of any passion that leads to injurious acts towards others, or causes us even to wish them harm. . . a selfish neglect of caring for the needy or suffering; all self-indulgence or unnecessary deprivation or excessive labor that tends to injure health. . . (seventh) not only acts of impurity, but sensual thoughts and desires, or any practice that tends to excite them. . . evil thought or look. . . as truly sin as is the unlawful deed. . . (eight) condemns man-stealing and slave-dealing. . . wars of conquest. . . theft and robbery. . . demands strict integrity in the minutest details of the affairs of life. . . forbids overreaching in trade. . . payment of just debts and wages. . . (ninth) False-speaking. . . attempt or purpose to deceive. . . By a glance of the eye, a motion of the hand, an expression. . . intentional overstatements. . . misrepresentation or evil surmising, by slander or talebearing. . . intentional suppression of truth, by which injury may result to others. . . (tenth) strikes at the very root of all sins, prohibiting the selfish desire. . . for that which belongs to another. . ." – Patriarchs and Prophets, pages 308, 309. MEMORY GEM: "And he shall speak great words against the most High, and shall wear out the saints of the most High, and think to change times and laws." – Daniel 7:25. STUDY AIM: To show that Gods love (law) was changed. INTRODUCTION: "The enemy of God and man desired to erase the knowledge of the Creator from the minds of this earth's inhabitants. To do this he incited the 'Edict of Constantine' March 7, 321 A.D. when he instituted the first Sunday law." – God's Covenant, pages 2, 3. 1. WHO WAS THE FIRST ONE TO REBEL AGAINST GOD'S LOVE (LAW)? Eze. 28:11-19; Isa. 14:12-15,19. NOTE --- "I ask our people to study the twenty-eighth chapter of Ezekiel. The representation here made, while it refers primarily to Lucifer, the fallen angel, has yet a broader significance. Not one being, but a general movement, is described, and one that we shall witness." – Special Testimonies, Series B, No 17, page 30. 2. WHAT IS THE MAIN OBJECT OF ATTACK BY THE ENEMY AND HIS AGENTS? Dan. 7:25. NOTE --- "He denounced the divine statutes as a restriction of their liberty, and declared that it was his purpose to secure the abolition of law." – E. G. White, Manuscript 125, 1907. 3. WHOM DOES INSPIRATION IDENTIFY AS THE "HE" OF DAN. 7:25? 2 Thess. 2:3-12. NOTE --- "The papacy is just what prophecy declared that she would be, the apostasy of the latter times. . . The apostle Paul, in his second letter to the Thessalonians, foretold the great apostasy which would result in the establishment of the papal power. . . Even at that early date he saw, creeping into the church, errors that would prepare the way for the development of the papacy." – Great Controversy, pages 571, 49. 4. WHAT DOES ROME HAVE IN COMMON WITH THE LEADER OF HEAVEN'S REBELLION? Ps. 78:10; 1 Sam. 15:23.
theories and traditions. . . This compromise between paganism and Christianity resulted in the development of the 'man of sin' foretold in prophecy as opposing and exalting himself above God. That gigantic system of false religion is a masterpiece of Satan's power – a monument of his efforts to seat himself upon the throne to rule the earth according to his will." – G. C. , pp. 49, 50. 5. WHAT DID THE PAPACY THINK TO DO WITH THE "SEAL" OR MEMORIAL OF THE LOVE (LAW) OF GOD? Dan. 7:25. NOTE --- "The Lord has clearly defined the road to the city of God; but the great apostate has changed the signpost, setting up a false one – a spurious sabbath. He says: 'I will work at cross-purposes with God. I will empower my delegate, the man of sin, to take down God's memorial, the seventh-day Sabbath. Thus will I show the world that the day sanctified and blessed by God has been changed. That day shall not live in the minds of the people. I will obliterate the memory of it. I will place in its stead a day bearing not the credentials of heaven, a day that cannot be a sign between God and His people. . . Through my vicegerent I will exalt myself. The first day shall be extolled, and the Protestant world shall receive this spurious sabbath as genuine. Through the non-observance of the Sabbath God instituted, I will bring His law into contempt. . . I will make the observance of the seventh day a sign of disloyalty to the authorities of earth." – E. G. White, Review and Herald, April 17 1900. 6. WHAT IS THE "MAN OF SIN'S" TESTIMONY REGARDING	THIS CHANGE? 2 Thess. 2:4. MEMORY GEM: "If ye LOVE me (Jesus) keep MY commandments." – Job 14:15. STUDY AIM: To identify Jesus' LOVE or law. INTRODUCTION: "Christ gave to Moses religious precepts (LOVE or law) which were to govern the everyday life. These statutes were explicitly given to guard the ten commandments. They were not shadowy types to pass away with the death of Christ. They were to be binding upon man in every age as long as time should last. These commands were enforced by the power of the moral law, and they clearly and definitely explained that law." – E. G. White, Review and Herald, May 6, 1875. 1. WHO SPOKE HIS LAW TO ALL ISRAEL? Deut. 5:22. NOTE	--- "God (the Father) graciously spoke his law (ten commandments) and wrote it with his own finger on stone. . ." – R&H, May 6, 1875. 2. WHO WAS WITH GOD THE FATHER AT SINAI? Ex. 19:3,20,24; 24:1,2,9-13,15,18; Prov. 30:4. NOTE --- "When the law was spoken, the Lord, the Creator of heaven and earth, stood by the side of His Son, enshrouded in the fire and the smoke on the mount." – E. G. White, Signs of the Times, Oct. 15, 1896. 3. DID JESUS, THE SON, ALSO DELIVER A LAW TO ISRAEL? Deut. 31:19,22, 24-26; John 14:15. NOTE --- "Christ (the Son), who went before Moses in the wilderness, made the principles of morality and religion (ten commandments) more clear by particular precepts (Levitical Law) specifying the duty of man to God and his fellow-men. . ." – E. G. White, Review and Herald, May 6, 1875. 4. WHO WAS THE AUTHOR OF THIS "ADDED LAW" OF LOVE (RESPECT FOR GOD AND MAN)? Deut. 32:1-4. NOTE --- "Christ, to enforce the will of his Father, became the author of the statutes and precepts (law or love) given through Moses to the people of God." – E. G. White, Review and Herald, May 6, 1875. 5. WHY WAS THIS ADDITIONAL LAW GIVEN BY CHRIST? ANSWER --- "The minds of the people, blinded and debased by slavery and heathenism, were not prepared to appreciate fully the far-reaching principles of God's ten precepts. That the obligations of the decalogue might be more fully understood and enforced, additional precepts were given, illustrating and applying the principles of the ten commandments. These laws were called judgments, both because they were framed in infinite wisdom and equity, and because the magistrates were to give judgment according to them. Unlike the ten commandments, they were delivered privately to Moses, who was to communicate them to the people." – Patriarchs and Prophets, page 310. 6. WHAT DOES SISTER WHITE AND THE BIBLE CALL THIS "ADDITIONAL LAW", THE REVELATION OF JESUS' LOVE (CHARACTER)? Mal. 4:4; Josh. 1:7; 8:32; John 1:17,45; 7:19,23,24,49,51; Ex. 15:26; Deut. 17:19; 26:16. NOTE --- "We are to become familiar with the Levitical law in all its bearings; for it contains rules that must be obeyed; it contains the instructions that if studied will enable us to understand better the rule of faith and practice that we are to follow in our dealings with one another." – E. G. White, Letter 3 1905. "Therefore, these two temples are types of two sections of the Christian church with the anti-typical sanctuary service made up of these two laws moral and ceremonial." – The Shepherd's Rod, Vol. 2 page 268. 7. DID THIS "ADDED LAW" OF LOVE FROM JESUS EXIST BEFORE SINAI? Lev. 11:45-47; Gen. 7:1,2; Num. 18:26; Gen. 4:4; 14:8-20. NOTE	--- "The plan of salvation had been laid before the creation of the earth. . ." – Patriarchs and Prophets, page 63. 8. SINCE THE TEN COMMANDMENT LAW GIVES THE KNOWLEDGE OF SIN, WHAT KNOWLEDGE DOES THE "ADDED LAW" OR LOVE OF JESUS REVEAL? John 1:29. NOTE	--- "While Moses was in the mount, God presented to him, not only the tables of the law, BUT ALSO THE PLAN OF SALVATION (written by Moses in a book, Deut. 31:24-26)." – Patriarchs and Prophets, page 330. MEMORY GEM: "I will delight myself in thy statutes: I will not forget thy word." – Psalms 119:16. INTRODUCTION: "Christ, who went before Moses in the wilderness, made the principles of morality and religion more clear by particular precepts, specifying the duty of man to God and his fellowmen, for the purpose of protecting life, and guarding the sacred law of God, that it should not be entirely forgotten in the midst of an apostate world." – E. G. White, Review and Herald, May 6, 1875. 1. WHAT WAS THE FOUNDATION OF THE NATIONAL OR LEVITICAL LAW OF THE HEBREWS? Deut. 4:8; Lev. 23:2-44. NOTE --- "The rights of widows and orphans were specially guarded, and a tender regard for their helpless condition was enjoined. . . Aliens who united themselves with Israel were to be protected from wrong or oppression. . . The taking of usury from the poor was forbidden. . . Respect for magistrates and rulers was enjoined, and judges were warned against perverting judgment. . . Calumny and slander were prohibited. . . Again the people were reminded of. . . the Sabbath. YEARLY FEASTS were appointed. . . THESE LAWS were to be recorded by Moses, and carefully treasured as the foundation of the national law, and with the ten precepts which they were given to illustrate, the condition of the fulfillment of God's promises to Israel. . . Upon descending from the mountain, 'Moses came and told the people all the words of the Lord, and all the judgments. . . (and it) was written by Moses in a book." – Patriarchs and Prophets, pages 310-312. 2. HAS THIS LAW OF LOVE INFLUENCED THE NATIONS OF THE EARTH? Ex. 18:13-26; John 12:4-8. 3. HOW BINDING ARE THESE "LOVE-LAWS" TODAY? Acts 15:20, 29.
ments. They were not shadowy types to pass away with the death of Christ. They were to be binding upon man in every age as long as time should last." – E. G. White, Review and Herald, May 6, 1875. 4. GIVE EXAMPLES OF HOW WE MAY "LOVE" OR RESPECT (AGAPE) OUR BROTHER. Lev. 19:14-17; Ex. 21:33-36; 22:1-15, 22, 25; Lev. 18:1-12; Deut. 22:5. 5. GIVE EXAMPLES OF CHILDREN LOVING PARENTS. Lev.19:3. 6. GIVE EXAMPLES OF PARENTS LOVING CHILDREN. Deut. 4:9; 27:14-26; Lev. 10:11. 7. GIVE EXAMPLES OF LOVE IN BUSINESS DEALINGS. Lev. 19:35-37; Deut. 25:13-	15. 8. GIVE EXAMPLES OF LOVE TOWARDS ANIMALS. Deut. 25:4; Ex. 23:12; Deut. 22:1-4,6,7,10. 9. GIVE EXAMPLES OF LOVE FOR AUTHORITY. Ex. 22:28; Deut. 17:12. 10. GIVE EXAMPLES OF LOVE FOR GOD. Ex. 13:1-8; 22:29,30; Deut. 16:10,11; 23:23; Lev. 27:30-33. 11. WHAT GREAT MISTAKE DO CHRISTIANS MAKE TODAY? Col. 2:14-17; Heb. 8:1-13; Matt. 5:17,18. NOTE --- "Christians who extol Christ, but array themselves against the law (Levitical, magnifier of the Ten Commandments) governing the Jewish church, array Christ against Christ." – E. G. White, Review and Herald, May 6, 1875. 12. WHAT SHOULD WE DO REGARDING THE LEVITICAL LAW, THE LAW OF LOVE? Lev. 10:10,11; Deut. 4:1,2,6-9; Ps. 81:4; 105:1-12,45. NOTE --- "We are to become familiar with the Levitical law in all its bearings; for it contains rules that must be obeyed; it contains the instructions that if studied will enable us to understand better the rule of faith ad practice that we are to follow in our dealings with one another. No soul has any excuse for being in darkness." – E. G. White, Letter 3, 1905. INTRODUCTION: "Religion means the abiding of Christ (through His Word) in the heart, and where He is, the soul goes on in spiritual activity, ever growing in grace, ever going on to perfection." – Review and Herald, May 24, 1892. 1. WHOM DOES JOHN DECLARE THE WORD TO BE? John 1:1-4,14. NOTE --- "The doctrine of the incarnation of Christ in human flesh is a mystery, 'even the mystery which hath been hid from ages and from generations.' It is the great and profound mystery of godliness. . . Christ took upon Himself human nature, a nature inferior to His heavenly nature. Nothing so shows the wonderful condescension of God as this. . ." – Review & Herald, Apr. 5 1906. 2. HOW MAY WE HAVE CHRIST, THE WORD, IN OUR HEARTS? Ps. 119:11. See Introduction. NOTE --- "Many take it for granted that they are Christians, simply because they subscribe to certain theological tenets. But they have not brought the truth (Jesus in His Word) into practical life." – The Desire of Ages, page 309. 3. IN THE BOOK OF THE LAW (LEVITICAL) WHAT DID JESUS APPOINT? Lev. 23:1-11, 15-17, 24-44. NOTE --- "Again the people were reminded of the sacred obligation of the Sabbath. YEARLY FEASTS were appointed, at which all the men of the nation were to assemble before the Lord. . . These laws were to be recorded (written in a book) by Moses, and carefully treasured as the foundation of the national law, and, with the ten precepts which they were given to illustrate, the condition of the fulfillment of God's promises to Israel." – Patriarchs and Prophets, 311. 4. HAVE THE CONDITIONS FOR GOD'S PROMISES CHANGED? Mal. 3:6; James 1:17. NOTE --- "As a nation the children of Israel failed of receiving the benefits that God desired to give them. . . But though individuals and peoples may thus separate themselves from Him, His purpose for those who trust Him is unchanged. . . God's work in all time is the same . . . His plan are the same. . . Adherence to the principle of God's word will bring as great blessings to us as it would have brought to the Hebrew people." – Education, page 50. 5. WHAT ARE SOME OF THE CONDITIONS OF GOD'S PROMISES TO GLORIFY HIS PEOPLE? 1 Cor. 5:7,8; Ps. 81:1-4; Isa. 66:23; Zech. 14:16; Acts 18:21. NOTE --- "These statutes were explicitly given to guard the ten commandments. They were NOT shadowy types to pass away with the death of Christ." – E. G. White, Review and Herald, May 6, 1875. 6. WHO IS OUR EXAMPLE TO HELP US BECOME LIKE SAVIOURS? John 14:6; Obadiah 21; Song of Solomon 6:10. NOTE --- "We may, by following the example of the Saviour, be in holy communion with Him; and by daily seeking to imitate His character and follow His example, we shall be a blessing to the world and shall secure for ourselves contentment here and an eternal reward hereafter." – Test., Vol. 4, p. 227. "On the fourteenth day of the first Jewish month, . . . Christ, having eaten the Passover with His disciples, instituted that feast which was to commemorate His own death as 'the Lamb of God'. . . In like manner the types which relate to the second advent MUST BE FULFILLED AT THE TIME pointed out in the symbolic service. Under the Mosaic system (Levitical or Book of the Law of Moses). . . the great Day of Atonement, occurred on the tenth day of the seventh Jewish month. . . The tenth day of the seventh month, the great Day of Atonement. . . which in the year 1844 fell upon the twenty-second of October. . ." Great Controversy, pages 399-400. 7. WHAT DOES GOD PLEAD WITH US TO KEEP TODAY? Nahum 1:15. NOTE ---- "In our study of this prophecy we learned that this happens when the Assyrian falls, but the Lord's call to the church in Isaiah 52 to awake comes first. After she awakes she is to behold something and she is to do something. What is she to do? -- She is to KEEP HER SOLEMN FEASTS. She is to perform her vows. . . The Lord's Supper being one of the solemn feasts, it will be celebrated next IN the time (not after) when the wicked are no more TO PASS through the church." – The Symbolic Code, Vol. 12, Nos. 6&7, page 12. MEMORY GEM: "And he shall speak great words against the most High, and shall wear out the saints of the most High, and think to change times and laws." – Dan. 7:25. STUDY AIM: To show that Jesus' love (law) was thought to be changed by man. INTRODUCTION: "In destroying the knowledge of the ceremonial (Levitical) law in the dark ages, the enemy of the Messiah, hoped to destroy the knowledge of the Redeemer from the mind of earth's inhabitants; consequently causing man to worship false Gods." – God's Covenant, page 6. 1. OF WHOM WAS SATAN JEALOUS IN HEAVEN? ANSWER --- "The Son of God shared the Father's throne, and the glory of the eternal, self-existent One encircled both. . . the King declared that none but Christ, the only begotten of God, could fully enter into his purposes, and to him it was committed to execute the mighty counsels of his will. . . The angels joyfully acknowledged the supremacy of Christ, and prostrating themselves before him poured out their love and adoration. Lucifer bowed with them; but in his heart there was a strange, fierce conflict. Truth, justice, and loyalty were struggling against envy and jealousy. . . 'Why,' questioned this mighty angel, 'should Christ have the supremacy? Why is he honored above Lucifer?' " – Patriarchs and Prophets, pages 36,37. 2. WHAT DID LUCIFER DESIRE TO CHANGE? ANSWER --- "While claiming for himself perfect loyalty to God, he urged that changes in the order and laws of heaven were necessary for the stability of the divine government. Thus while working to excite opposition to the law of God, and to instill his own discontent into the minds of the angels under him. . ." – Patriarchs and Prophets, page 383. 3. WHO WAS THE FIRST HUMAN TO PARTAKE OF LUCIFER'S SPIRIT? Gen. 4:1-5. God because of the curse. . . for Adam's sin. He permitted his mind to run in the same channel that led to Satan's fall, -- indulging the desire for self-exaltation, and questioning the divine justice and authority (law)." – Patriarchs and Prophets, page 71. 4. WHAT WAS CAIN'S MISTAKE? Gen. 4:3. NOTE --- "They (Cain and Abel) were acquainted with the provision made for the salvation of man, and understood the system of offerings which God had ordained. . . Without the shedding of blood, there could be no remission of sin. . . But Cain, disregarding the Lord's direct and explicit command, presented only an offering of fruit." – Patriarchs and Prophets, p. 71. 5. WHAT TWO CLASSES DO CAIN AND ABEL REPRESENT? Matt. 25:2; 13:30. NOTE --- "Cain and Abel represent two classes that will exist in the world till the close of time. One class avail themselves of the appointed sacrifice for sin (according to God's law); the other venture to depend upon their own merits (man's law). . ." – Patriarchs and Prophets, pages 72,73. 6. WHAT ORGANIZATION THOUGHT TO CHANGE THE LEVITICAL LAW? Dan. 7:8,20,25. NOTE	--- "The new law has its own spirit, and its own sacrifice, and its own feasts (Easter, Christmas etc. ) which have taken the place of those appointed in the law of Moses (Levitical) If we would know the days (in place of the Passover, Pentecost, Day of Atonement, Feast of Tabernacles etc. ) to be observed, or the regulations about them, of the spirit in which they are to be kept holy, WE MUST GO TO THE CATHOLIC CHURCH, not to the Mosaic law." – Catholic Catechism quoted in Signs of the Times, Nov. 4, 1919. MEMORY GEM: ". . . where there is no type, there is no truth." – Shepherd's Rod, Vol. 2, page 10. INTRODUCTION: "Just as God chastened her in olden time by permitting Nebuchadnezzar, king of Babylon, to abolish the ceremonial system by destroying ancient Jerusalem and its temple, just so did He chasten her in the Christian era by permitting Rome to gain control over her and to supplant her true religious, system by a counterfeit -- a pagan priesthood and a pagan sabbath. THEN (not at the cross) was His word fulfilled: 'I will also cause all her mirth to cease, her FEAST days (Passover, Feast of Unleavened Bread, Feast of Weeks, Feast of Tabernacles, Day of Atonement), her new moons, and her sabbaths, and all her solemn feasts." – The Latest News for Mother, page 25. 1. WHO IS A TYPE OF THE PAPACY? See Introduction; Dan. 4:30; 5:1-4; 2 Chron. 36:7; Dan. 1:1,2. NOTE --- "As the true sanctuary worship was abolished by ancient Babylon at the captivity of Israel, with the destruction of the temple, just so the papacy did away with the truth and strategically supplanted here on earth the meaning of the mediatorial work of Christ in the heavenly sanctuary. . . And as the sacred vessels were carried from the sanctuary and set up in a pagan temple in a heathen land, just so the papacy trod down the 'truth' and set up a pagan priesthood in a so-called Christian church during the dark ages, while the 'woman' (church) was in the wilderness, which was typified by the heathen land -- Babylon." – Shepherd's Rod, Vol. 2, page 271. 2. DID THE EARLY CHRISTIAN CHURCH OBSERVE THE LEVITICAL LAW? 1 Cor. 5:7,8; Acts 18:21; 15:29. Levitical) was thrown out from the church, or as Daniel puts it, 'trodden under foot'. . . and substituted by a pagan priesthood, with pagan ceremonial, and moral laws, or papal service. . ." – Shepherd's Rod, Vol. 2, page 268. ". . .the Jewish church. . . can in fact be the shadow and figure of the Catholic Church alone. . . If Christ is come 'not to destroy but to carry to perfection,' all that is imperfect in the synagogue ought to be perfect in the church -- high priesthood, sacraments, sacrifices, etc. This perfection we perceive through the Catholic system." – Catholic Doctrine as defined by the Council of Trent, by Rev. A. Nampon, quoted in Protestant Magazine, Jan. 1913, pages 10, 11. 3. WHAT MUST THE TRUE CHURCH HAVE? Rev. 12:17; 19:10. NOTE ---"The Protestant churches which were raised up before the 'woman' returned from the wilderness were in total darkness concerning the sanctuary service. Therefore, they are not represented by the 'woman,' or by the 'temple,' for,. . . the typical temples represent both sections of the church with TWO DIVINE LAWS; namely, moral and ceremonial. Thus the 'woman' represents a church that keep the 'commandments of God -- moral law, and have the testimony of Jesus Christ' -- ceremonial law or the plan of salvation revealed in the light of 'The Spirit of Prophecy.' " – Shepherd's Rod, Vol. 2 page 268. 4. HOW DOES EARLY HISTORY RECORD ROME'S CHALLENGE OF THE LEVITICAL LAW? Dan. 7:25. NOTE --- "Polycarp disciple of the apostle John and by him ordained bishop of Smyrna (approximately 106-168 A.D.) was chief of all Asia, where he saw and had as teachers some of the apostles and of those who had seen the Lord. He, on account of certain questions concerning the day of the Passover, went to Rome in the time of the emperor Antoninus Pius. . ." – Nicene and Post Nicene Fathers, Vol. III, page 367. ". . .Philip, one of the twelve apostles. . . John. . . who reclined upon the Lord's bosom. . . All these observed the fourteenth day of the passover according to the Gospel. . ." – Nicene and Post Nicene Fathers, Vol. I, page 242. "In 196 A.D., Victor, bishop of Rome, attempted to impose on all the churches the Roman custom of having the Passover. . . celebrated every year on Sunday." – History of the Popes, Vol. I, pages 18,19. 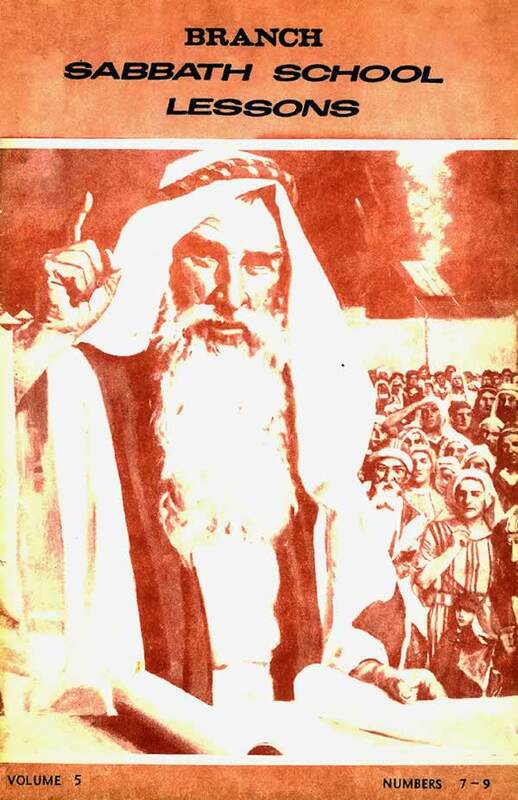 MEMORY GEM: "Behold, I will send you Elijah the prophet before the coming of the great and dreadful day of the Lord." – Mal. 4:5. STUDY AIM: To show who restores the love of Jesus (the Levitical Law). INTRODUCTION: "Prophecy must be fulfilled. The Lord says: 'Behold, I will send you Elijah the prophet before the coming of the great and dreadful day of the Lord. ' Somebody is to come (future from Sister White) in the spirit and power of Elijah, and when he appears, men may say: 'You are too earnest, you do not interpret the Scriptures in the proper way. Let me tell you how to teach your message.' " – Testimonies to Ministers, page 475. 1. WHAT IS ELIJAH'S WORK? Mal. 4:6; Nahum 1:15 first part; Deut. 32:3; Rev. 3:12. 2. WHO IS TO RESTORE WHAT THE "MAN OF SIN" THOUGHT TO CHANGE (Dan. 7:25)? Mark 9:12. 3. WHAT DOES ELIJAH TELL US TO DO? Deut. 11:1; Nahum 1:15 last part; 1 Cor. 5:7, 8. 4. HOW ARE WE JUDGED TODAY? Mal. 4:4.
we relate ourselves to the newly restored feasts of the ceremonial law." – God's Holy Feasts, page 8. 5. WHAT IS BEING DONE TO HINDER THE WORK OF ELIJAH? 6. WHAT SHOWS THAT ONE HAS BECOME A "LOVING" PERSON? Deut. 6:7,24,25. NOTE --- "Your obeying 'all the commandments, and the statutes, and the judgments' of the moral law of Moses, you see, is your evidence that you have been born again (become a 'loving' person), that you have been endowed with power from above, that you are enabled to choose the good and to refuse the evil, that you are the children of God. Keeping the commandments and the statutes in the Lord, then, is the light and shield of your life. It is the outward sign that by the life of Christ you have overcome the Enemy of your soul and body. This system of worship, therefore, is truly the Righteousness by faith that brings the righteousness of Christ in the people of God." – Timely Greetings, Vol. 2, No. 37, page 24. 7. WHO HELPS ELIJAH TO SOUND HIS MESSAGE OF LOVE? Rev. 7:4; 9:16; Luke 13:28; Dan. 12:2,3. NOTE --- "Your work, my work (E. G. White), will not cease with this life. For a little while we may rest in the grave, but, when the call comes, we shall, in the kingdom of God, take up our work (of saving souls) once more (not in heaven or in the new earth!)." – Testimonies, Vol. 7, page 178. 8. WHEN DID THE "ANTITYPICAL" ELIJAH APPEAR? Mal. 4:5. ". . .V. T. Houteff, wrote that he did not know when this judgment (brought by antitypical Elijah) would start, but that it was very near (imminent). He died February 5, 1955; and, in the following Autumn, the 'Former Rain' of the investigative judgment for the Living (Elijah's message) started to the Davidians. The next year it began for the Laodicean church." – Elijah, page 11. MEMORY GEM: "Behold the man whose name is The BRANCH; and he shall grow up out of his place, and he shall build the temple of the Lord." Zech. 6:12. STUDY AIM: To identify the last message of mercy. INTRODUCTION: "The last rays of merciful light, that last message of mercy to be given to the world, is a revelation of His character of love." – Christ's Object Lessons, page 415. 1. HOW MAY ONE KNOW WHEN THE JUDGMENT OF THE LIVING BEGINS? Amos 3:7; Joel 2:1. NOTE --- "But when our High Priest shall begin the atonement for the living, there must be a message of present truth -- sounding of the trumpet -- urging every one to lay hold on the Lamb of God. . . Unless the close of the judgment for the dead and the commencement for the living be made known to us, we would have no present truth while the judgment for the living is in session." – Shepherd's Rod, Vol. 2, page 164. 2. WHAT IS THE INVESTIGATIVE JUDGMENT OF THE LIVING? ANSWER --- "It is the light of the three former messages, plus the Mark of Jesus' 'new name' by the 'man in linen' (Eze. 9:3,4), and the Ceremonial law of the New Testament harmonized with the Old Testament in the light of the Spirit of Prophecy. The dead are judged by the Ten Commandment Law. But the living are judged by how they relate themselves to both Laws -- the Ten Commandments and the Ceremonial feasts of the Sabbath, Passover, Pentecost, Atonement, Feast of Tabernacles, and New Moon. The Sabbath marks the weeks; the Moon the months, the seasons, and Feasts; and the sun, the days and years." – Elijah, page 11. 3. WHAT PROPHECY IS TO BE UNDERSTOOD WHEN THE JUDGMENT OPENS FOR THE LIVING? Zech. 6:12; 3:8; Isa. 11:1. NOTE --- "Zechariah's vision of Joshua and the Angel (Christ -- the Branch – G. C. 415) applies with peculiar force to the experience of God's people (S.D.A.) in the closing up (for the living) of the great day of atonement." – Testimonies, Vol. 5, page 472. "The judgment is now (1888) passing in the sanctuary above. For many years (since 1844) this work has been in progress. Soon -- none know how soon -- it will pass to the cases of the living." – Great Controversy, page 490. 4. WHERE IN THE REVELATOR'S PROPHECIES IS THE BRANCH MESSAGE FOUND? Rev. 18:1-3; 14:14-18. NOTE --- "Then I (E. G. White) saw another mighty angel commissioned to descend to the earth, to unite his voice (message) with the third angel. . . The work of this angel comes in at the right time to join in the last great work of the third angel's message as it swells to a loud cry. . . THIS MESSAGE SEEMED TO BE AN ADDITION TO THE THIRD MESSAGE. . ." – Early Writings, p. 277. "Hence the movement symbolized by the angel coming down from heaven. . . uniting with the third angel's message, constitute the FINAL WARNING to be given to the inhabitants of the earth." – Great Controversy, page 604. 5. WHAT IS THE BRANCH'S SPECIAL MESSAGE OF LOVE TO THE GENERAL CONFERENCE? Zech. 2:6-13; Isa. 30:15-19. NOTE --- " 'If after a time the Lord says, move away from Washington, we must move. . . When the Lord tells us to move (see Amos 3:7), we are to obey, however inconvenient and inconsistent such a command may seem to us.' R. H. August 11, 1903. By E. G. White. The conclusion is that if the General Conference Brethren wish to be a step ahead of the arch-enemy of Jesus, they will quickly move headquarters to the place where the Bible says it will be located in the last days. . . '. . . for the law shall go forth of Zion, and the word of the Lord from Jerusalem.' Micah 4:1, 2." – God's Holy Feasts, page 11. "Everyone must pray for our Brethren at the Headquarters of the work in Takoma Park, Washington D. C. The warning of the Fifth Angel is, that soon no one will be permitted to buy or sell in Takoma Park without receiving the mark of the beast which is enforced by the image beast of Rev. 13:11-18. Therefore, the admonition to Headquarters in Takoma Park is to sell General Conference and move before they are forced to either flee. . . or receive the mark of the beast. Failure to act promptly will not only jeopardize their own chances of salvation, but will risk the safety of the whole church." – God's Holy Feasts, page 10. I hardly know how to address you, as I have had such bad treatment from both S. D. A. 's and D. S. A.'s. From the first, because I accepted the Shepherd's Rod, from the latter I have been robbed by those who should have been leading the work. . . Then again, I have been cast off by _____, _____, _____, _____, and many more, since the debacle in (at) Mount Carmel, after Bro. Houteff died. . . I tried to get some information on what caused such a dreadful thing to happen at Mt. Carmel; also what caused Florence Houteff to act the way she did, after her husband died. . . I think the whole affair is terrible in the extreme. Did they never remember they were a special people God had chosen to take the three angel's messages to the world? I have been an S. D. A. since 1944, and a D. S. D. A. since 1959. I have held positions in the Church viz: Secretary, Sabbath School teacher, Senior Deaconess, for several years, and given of my very limited means freely and generously. I am an O. A. P. and have only my pension. I am now 84. I have been reading with great interest the Branch Sabbath School Lessons, Vol. 4 Nos. 10 and 11 on Eze. 17. The explanation of the two eagles was very enlightening. I wonder, when this reaches you, if you will send me the Jezreel letter you mention several times. I have never seen it. Also I would very much like a picture of Bro. Houteff, as I have never seen one of him. I have several of Sister White. . . Now Mr. Roden, I understand there are many splinters, factions, call them what you will. None of two agree together, and all seem certain they are the only ones of whom God approves and each thinks they are the only ones to get into the Kingdom. . . I believe in Sister White wholeheartedly, as well as Bro. Houteff, so how am I going to find out which of the factions is right. Will you please answer this as soon as possible, as I cannot have many more years in this evil world. Yours, hoping to get this clarified. I should like to thank you for your paper which I received last week on Saturday morning. In fact I was very happy when I received your paper. I am praying God for you to help you all the days of your life and leads you well. Again, I should like to ask you for some magazines and books. . . And Sir there are my friends here and they are also asking you kindly to send, for them the Holy Bibles. . . If you can see mercy for us you just send us those books which are used. Through the power of God, I hope you can continue helping us. May God bless you all the days of your life. I am yours sincerely a brother in Christ. I'm a member of a church that claim to have the truth (I've never seen anybody live up to it). We worship on the Sabbath. I'm not a Davidian nor a Laodicean and I hate the world. Will you please tell me then who am I? Because I just learned that this church even has a BRANCH (that's why I'm writing to you). I love the truth and want to know more about it. The Shepherd's Rod gave me lot of information I did not know before. Are you the same or do you know even more than they. I'm sorry but this last church of God seems to be pretty well mixed up so please let me stick to the Bible and if you understand all of it you are the man who can answer my questions. In Rev. 14 there are three angels with three messages given to the earth verses 6-12. Verse 14, talks about somebody sitting on a cloud. Verse 15, angel No. 4 is crying to the "one" on the cloud and not to the inhabitants of the earth. As a result the "one" on the cloud goes to do his business on Earth. Verse 17, No. 5 angel is coming out of the heavenly temple. He Has No Message except a sharp sickle like the "one" on the cloud. Verse 18, No. 6 angel comes from the altar crying to No. 5 (Not giving message to Earth) to do his business. Therefore chapter 14 has six angels. 3 with earthly message. No. 4 with an order to the "one" on the cloud. No. 6 with an order to No, 5. So please tell me which are the five angels. What are the five messages, who and where is the missing one angel and who is the "one" on the cloud?! Yours with brotherly love in Jesus. We received four lessons for the Sabbath School of the Branch. We can get many things good from your message. . . The Davidians were supporting us some Sabbath School lessons and tracts and we were interested and distributed some to our friends. But there are no more Davidians in Mt. Carmel and The Branch are alive. Long time already we heard of this message and were waiting only for the message to reach our home. We h ave now some answers and are planning to request a Bible, even if it is not new. . . because we are very poor in the Philippines. . . We want some pamphlets to distribute to our friends. While we were Davidians, they were sending us some pamphlets also clothing, so our brethren were happy because we give them to them. Your brother in Christ. Greetings in the lovely name of our Lord and Saviour Jesus the Branch, whose we are, and whom we serve. . . I want more S.S. Lessons to distribute to those who love the Lord Jesus the Branch. . . I am living nearly 150 miles from the Mission Station of S.D.A. The Sabbath School Lessons have done a great deal of work, and people here are anxiously waiting for the remaining S.S. Lessons. Kindly notify me about the troubles you are soon to face. May God bless the work at Mt. Carmel Center, to grow day by day. I remaining, waiting to receiVe those things which I have asked for. Yours in the Lord Jesus the Branch. The Feast of Tabernacles was held at New Mt. Carmel Center from October 15 through October 22, and a wonderful time was experienced by all who were able to attend. One family made the trip from Arizona for the Day of Atonement and stayed over for the week of Tabernacles. We look forward to seeing them again next year for the Passover week. Although Passover is some time off yet we would remind all of the preparations necessary for keeping this feast in the proper manner. Paul instructs us to: "Purge out therefore the old leaven, that ye may be a new lump, as ye are unleavened. For even Christ our passover is sacrificed for us: Therefore let us keep the feast, not with old leaven, neither with the leaven of malice and wickedness; but with the unleavened bread of sincerity and truth." 1 Cor. 5:7, 8. Remember, unless all leaven is out of your house, you are not prepared to partake of the Passover supper. All such articles as sauerkraut, cheese (including cottage cheese), butter milk, sour cream, sour-cream butter, salad dressings containing vinegar, soya butter, yeast, soda, baking powder etc., contain leaven and must be out of our houses before sundown on Abib 14, April 9, l971. Dry beans, peas and grains may remain in the house, unless they are steamed or cooked in water or some liquid. When cooked, these articles become leavened within a short period of time. Read Exodus 13:7-10. Also it would be well to read Exodus 12:48; Acts 16:3; Romans 2:25; 3:30; Acts 15:16,17; Patriarchs and Prophets, page 411; Exodus 12:13. Preparations are underway once again to present the story of Esther in costume. Each year the children from the Branch Elementary and Junior High classes enact this story and draw a modern day parallel to God's people today. The feast of Purim s a feast of deliverance and it is by faith that we keep it now, believing that as God delivered His people anciently from the death decree and the hand of Haman the wicked prince of Medo Persia, so He will deliver His people today from the Sunday laws and the death decree that is connected with it. Please notice that second Passover is from May 10 through May 16 and not May 10 through May 17 as was previously announced.